It has been a heroic month for Texas basketball. Between the Texas Tech men’s basketball, Baylor women’s basketball and Dirk Nowitzki’s retirement, Texas basketball fans have never known joy like they have the last few weeks. The question now on many minds is whether or not this basketball joy will continue. College basketball momentum is tough when players are constantly graduating and now that Dirk is gone, will the ideals of legacy and loyalty continue for the other Mavericks? The season of Lent is a heroic season for believers. We get to watch again as the ultimate battle plays out on the courts of the high priest Caiaphas and Pilate the governor. Each year we watch Jesus execute his plays perfectly as our Savior to live, die and rise to give us forgiveness and life. Each year Jesus comes out victorious in his battle, but each year our faith in him is threatened by sin. This Palm Sunday morning, our second reading from Hebrews 12 encourages us when we grow weary and lose heart against sin to focus on Jesus to finish the race. On this Palm Sunday, we heard again the cries of the people in our gospel reading as Jesus entered the city of Jerusalem. Jesus was welcomed like a hometown hero at a championship game, but the crowds didn’t understand what type of game Jesus was going to play. The large crowds were looking to Jesus to reestablish the throne of David to rule as King of Israel without any more Roman influence, but Jesus’ heroic path to victory was entirely different. Jesus entered Jerusalem one last time to celebrate his final Passover meal, days before he was betrayed and put on the cross, where he would give his life as the true Passover Lamb. Only the few who saw Jesus through the eyes of faith were ready for what was coming next. 2…the pioneer and perfecter of faith. Jesus deserves our praise because finished the race to give us life. He was the first to win, and we will take hold of the same prize through him. 12:1 Therefore, since we are surrounded by such a great cloud of witnesses, let us throw off everything that hinders and the sin that so easily entangles. God promised deliverance to his people throughout the Old Testament and to us, but it is a deliverance from a race we are not equipped to finish. We are not equipped for our race toward Jesus and his joy because of sin. There is no other God that can save us and there is no other race toward him except faith in Jesus. 2…For the joy set before him he endured the cross, scorning its shame, and sat down at the right hand of the throne of God. Jesus was ready for the cross and endured that punishment sure he would win, sure of heaven and sure of the victory he was winning for us. This victory is what we put our hope and trust in. 1…And let us run with perseverance the race marked out for us. Our boast will always be in the gift of God’s grace and what has been given to us through Jesus. It has been a heroic month for Texas basketball, but more than that it has been a heroic Lent for Jesus. And in the coming days we get to watch again the epic showdown between Jesus and all who opposed him. Again, he will execute his plays perfectly as our Savior to live, die and rise to give us forgiveness and life. 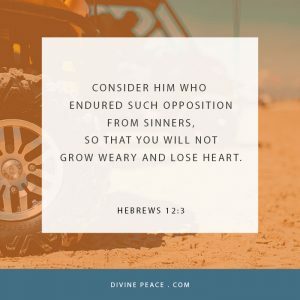 As we face our own opposition from sins entanglement, may God keep us from growing weary and losing heart by keeping us focused on Jesus to finish the race and hold on to his promise of eternal life. Amen.